With a wide range of housing, prices can start at about $500,000 and peak at more than $5 million, says a real estate agent. 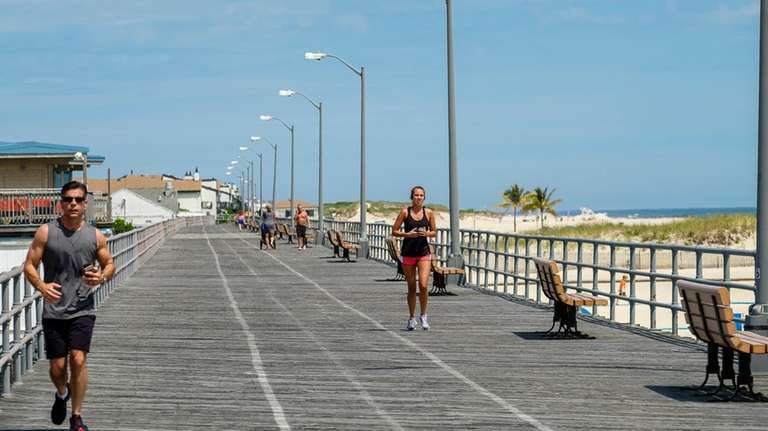 THE SCOOP With its white sand, resident-only beaches and a roughly 20-mile commute to Manhattan, Atlantic Beach offers residents the best of two worlds, says village Mayor George Pappas. “We have a private little beach community and great proximity to the city for the nightlife, museums and things like that,” he says. Atlantic Beach, with the village neighboring the hamlet Atlantic Beach Estates, shares a peninsula with Long Beach. Development in the area is at its peak, Pappas says, with buyers renovating or knocking down homes. “We used to be a small bungalow community and now people are buying these bungalows and building year-round homes,” he says. Wendy Ponte, of Beach West Realty, a longtime Atlantic Beach resident, says the village features stucco and Art Deco houses with a beach vibe and the estates features Contemporary-style homes. “And everything is walkable to the beach,” Ponte says. With a wide range of housing, prices can start at about $500,000 and peak at more than $5 million, she adds. Atlantic Beach Estates, Ponte says, includes its own private beach club with dues incorporated into residents’ property taxes. Atlantic Beach also features two private, gated communities: Pebble Cove and The Water Club. “Those are very much in demand because they’re on the ocean," says Annett Ellis of Annett C. Ellis Realty, a 40-plus year resident. With its pristine beaches and easy commute, the area has long been a draw for Manhattan residents in need of rentals or second homes west of the Hamptons, Ellis adds. Atlantic Beach is almost entirely residential, featuring three restaurants, two delis, a surf shop, a nail salon and a real estate office, Pappas says. Soon to be completed is a $3 million project on Ocean Boulevard, the main road along Atlantic Beach's boardwalk and beach clubs, that repaved the roadway, improved drainage and added center median parking with new plantings. A similar project on Park Street, from the Atlantic Beach Bridge to the Long Beach border, is slated to begin in the fall of 2019, Pappas adds. The Atlantic Beach Tennis Center, which offers camps and clinics, is undergoing a renovation that is expected to be completed by the spring of 2019. The village, Pappas says, also hosts community events, such as concerts and movie nights on the beach that are open to the public. SALES PRICE Between June 1, 2017 and June 19, 2018, there were 30 home sales with a median sale price of $667,500, according to the Multiple Listing Service of Long Island. The low price for that period was $430,500 and the high was $1,930,000. During that time period a year earlier, there were 34 home sales with a median sale price of $636,250. The price range was $275,000 to $4.9 million. SCHOOLS Most students attend Lawrence High School.